Zella is bit of a mousy bookworm, and unsure in social situations not of an academic nature, though if riled to anger she becomes a fierce spell wielding hellcat. She found herself in such a situation, caused grievous injury to another student and, though she was defending herself, was suspended from school. 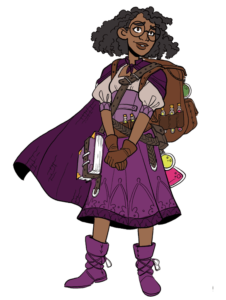 Without a dorm wherein to live, she found herself in need of funds and so became a wizard for hire. Vesska, Mugg and Huck needed some wizardly knowledge on their adventures. 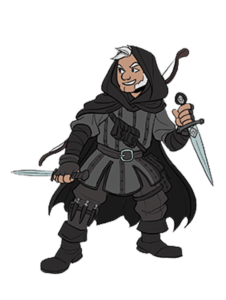 Mugg is a bit of a pack rat, because of his boy scout always-be-prepared way of thinking and carries a massive and somewhat overloaded backpack. He has little in the way of formal education, save the trades of mining and basic metal work. 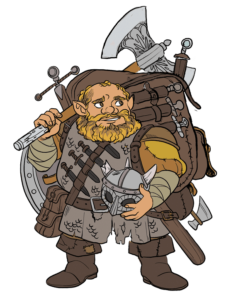 He became an adventurer to gain respect enough to be allowed to marry his beloved Heartha -a dwarf maid far above his station- and to prove he is worth more than his strong back. He feels protective of the somewhat shy Zella, though a kinship, as he too feels somewhat out of place in the wide world. Huck comes from a long line of guild-made thieves. Ten generations of his Snipeshadow family have been members of The Ghost Key Syndicate – a powerful thieves’ guild. Huck has strayed a bit from the guild, seeing the structure and rules too confining for his liking. In fact, he dreams of making a full break from the guild and his family one day. Huck met Mugg when the country bumpkin dwarf first came to the big city, and was quickly robbed of all his meager funds and most of his belonging by a gaggle of pickpockets. The streetwise Halfling took pity on the dwarf and assisted him in tracking down his belonging and giving the pickpockets a good trouncing. Being the youngest daughter from a matriarchal noble family, there was little chance she would ever have to take on the mantle of rulership, a fact that suits the tomboyish elf maiden just fine. Against her mother’s wishes Vesska served with the Greyguard Rangers until the night her entire scouting party was ambushed by a massive orcish warband. Only Vesska survived, though even badly wounded, she managed to get warning to the peak watch so that the orcs were put down before they caused further harm to the elven homelands. 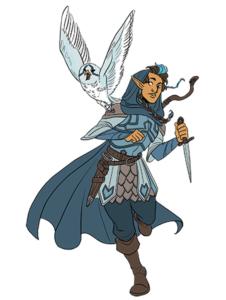 Vesska, left the overbearing influence of her mother as soon as she was healed enough to travel, with only what she could carry and her faithful owl Flake at her side. A short time later she met Mugg and Huck while lending the two a hand in a fight with a tribe of goblins and so became their leader.